Language development is one of the most fundamental developmental tasks in early life. On this account, particularly parents are frequently worried about their children making progress in this area and are wondering whether to request therapeutic support, if they do not. In this context, the main issue of intervention is to “most effectively […] improve the chil- dren´s ability to communicate” (Donaldson, 1995, p.61). 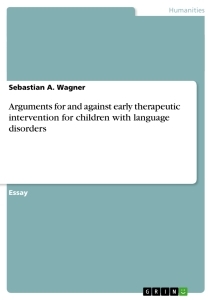 This essay will critically discuss the pros and cons of early therapeutic interventions’ (ETI) necessity for children without patho- logical findings, as well as for Late Talkers (LT) and Specific Language Impairment (SLI) as examples for children with language disorders; and will argue that ETI should be carried out on principle, because the costs are outbalanced by the benefits. It will conclude that selective prevention for individuals and populations at high risk is the best approach. The Normal language acquisition takes place in a critical period of time and is charac- terised by early acquisition and individual differences. This time window is critical, because from about the age of five years, the ability to learn a native language drops and remaining deficits are unlikely to be resolved (Bishop & Mogford, 1993). Early acquisition means that basic language acquisition is usually completed by three years of age (Bates, Dale & Thal, 1995). However, in terms of language development in general, Bates et al. (1995) underlined the intense differences between and within individuals. These variations are stable and occur in all phases and areas, for instance relating to learning style. If a child shows a deficit, it is therefore difficult to decide whether it is a matter of ‘language delay’, i.e. development is “slower than average” or a ‘language disorder’. This means it is different from the norm and the child’s language is deviant compared to peers (Donaldson, 1995, p.4; Crystal & Varley, 1998). Taking all this into consideration it is hence not surprising that there are debates about to what extent therapeutic interventions should be carried at an early stage of language devel- opment, if at all. The next paragraphs address this issue regarding children without pathologi- cal findings. An argument in favour of ETI is that it promotes normal language development. Paul (2000) suggested that parent-child interaction (PCI) generally increases exactly this, whereas Gibbard, Coglan and MacDonald (2004) outline the benefits of such early interventions in the long term. For example, Paul (2000) depicts PCI as a ‘naturally and healthy food’ that every parent can administer to his normal-developing child without doing any harm. Consistent with this idea, Gibbard et al. (2004) allege that child-specific advice increases the quality of PCI that finally affects their communication in a positive way. As a result these authors found that the group with better PCI make greater gains in language development. This shows that the benefits of ETI exceed the costs that are at most made of more effort for the parents in com- municating with the child. However, not every parent has the ability to implement good communication with his or her child even when instructed. The next paragraph talks about reasons why ETI for children without pathological findings is unnecessary. As mentioned before there is a wide range of variation in normal language develop- ment (Bates et al., 1995; Letts & Edwards, 1999). Bates et al. (1995) report that only 36% of the variance of infants’ word comprehension is clarified by a correlation with age. They con- clude that the rest must be a combination of the factors ‘individual variation’ and ‘parental observer bias’. Therefore, the financial and time effort of accessing a therapy is not justifiable since one cannot assess whether one’s child is located within or outside of normal variation in language development at this early age. However, parental report used in this study has its limitations as not all areas of language development can be measured easily (Bates et al., 1994). For example nothing can be said about imitations and spontaneous speech. This narrows the conclusiveness of their findings, because a bulk of the unsolved variance could be hidden in the factor ‘parental report bias’. The subsequent paragraphs address children classed as LT who already exhibit linguistic deficits.